The Island of New Guinea is named after the African country named Guinea. PNG is one of the very few places on earth that lie close to the equator where places at higher altitudes experience snowfall. Until 1933 the country used seashells as its national currency. After that, it switched to the Kina. 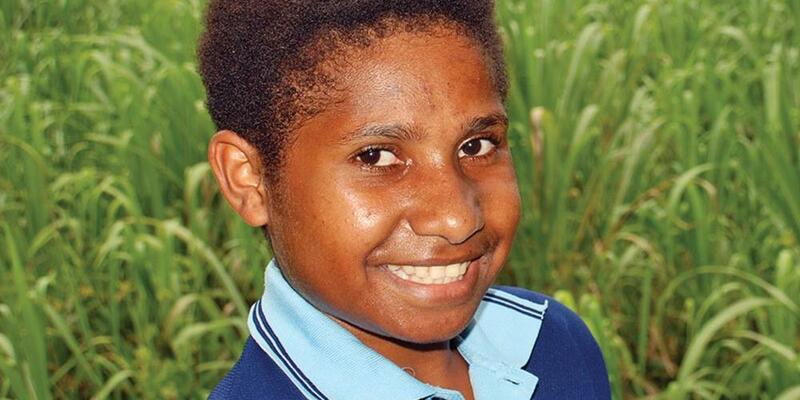 Dorcas lives in a village in the mountains of eastern Papua New Guinea. [Locate Port Moresby on the map and trace a line northeast into the heart of the peninsula to show where Dorcas lives.] While attending summer camp last year she had an idea. Camp was such fun! The leaders told Bible stories and taught the children new songs to sing and simple crafts to do. And every day the children received a card with a Bible text on it to learn. As Dorcas held her Bible text card one day, the idea came to her. When she returned home from camp, she asked her father to make copies of the Bible verse cards to share with her friends at school. Then she invited two of her best friends to meet her during recess. “I’ve brought you something,” Dorcas said. “It’s a Bible verse. Let’s meet during recess to practice them and learn them together.” The girls accepted the cards, which were nicely decorated, and agreed to learn the Bible texts. But when they met the next day, the girls had a surprise for Dorcas. The next morning Dorcas’s friends met her on the playground. But instead of just two girls, 10 children met Dorcas during recess. They all wanted Bible verse cards, and they all agreed to memorize the Bible texts. Dorcas was amazed that so many children wanted to learn God’s Word! She needed more Bible verse cards! Dorcas gave each child a card and invited them to come back the next day to practice the Bible verses. Every day more children came to Dorcas during morning recess to say their Bible verse and get another card. Within two weeks 20 children were learning Bible verses during school recess. That was a big group! Six months after Dorcas started the Bible group, 100 children and some of their parents were coming to Dorcas’s Wednesday and Friday meetings. And 50 or so were attending on Sabbath morning for worship. Dorcas planned a regular Sabbath School program for the children, and her mother and dad helped conduct the worship. One day Dorcas’s parents told her that several people had given their hearts to Jesus, and five wanted to be baptized! What good news that was! “It makes me happy to know that something I did is helping others learn about Jesus,” Dorcas says. Because Dorcas let God lead her, a whole new church was planted in her village. We can do big things for God if we follow the ideas that Jesus gives us.